Fundraiser by John Massé : The miraculous story of my life and death(s)! The miraculous story of my life and death(s)! I'm writing a book about the unbelievable journey, of experiencing death...TWICE, and what it's like to wake up after a 2 week coma, with a severe Traumatic Brain Injury, the arduous struggles of rehabbing through all the pain, after suffering a broken back, cracking 12 ribs, snapping my collarbone (that will be sticking out, for the rest of my life), having my stomach sliced open to stop internal bleeding, having my lungs collapse, doctors having to cut a hole in my throat, to use a tracheotomy, so I could breathe (and eventually talk!) 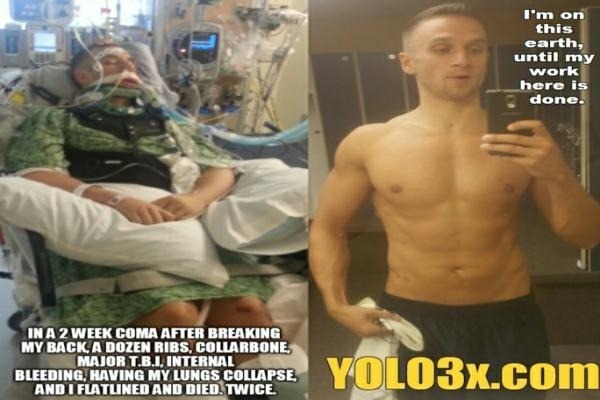 - and how miraculous it is to be alive, after the doctors said I may never wake up from my coma... and if I ever did, that I may not lead any type of "normal" life with the extent of my brain injury, broken bones/ribs/shattered spine, and that I may NEVER walk, or talk again! God had much bigger plans for my life. I'm just finishing writing this book, but the costs associated with getting it edited, formatted, printed, copyrights, published, etc. are pretty significant, so I really need YOUR help in supporting this incredible story being told! It may sound cliche, but EVERY little bit helps! Whether we only raise $20, or we exceed our goal, your contributions are greatly appreciated. This is the story about my life and death(s), but I guarantee, you'll laugh, you'll cry, or at the very least, be encouraged, knowing that tomorrow is not promised, and if you're reading this, you are blessed! *Once we raise the funds needed for everything to get this edited/formatted/copyright/legal/produced/published, etc., we will have an official release/publishing date! **A portion of the book sales will be donated to Sharp Memorial Hospital and Mount Sinai Rehabilitation Hospital in appreciation of the excellent care they provide and I received, contributing to my miraculous recovery. Every donor will receive a thank you card, as I really need, and appreciate your help. The more you give, the more you will help me in getting my story out (and the more you will get in return)! $25+ You will be the FIRST to receive a personalized, autographed copy of the book! $100+ You will receive: all the above, plus YOUR name (and/or business), IN the book! Any and all donations will be gratefully received. Thank you for all your support!